Identity – Stranded at a desolate Nevada motel during a nasty rainstorm, ten strangers become acquainted with each other when they realize that they’re being killed off one by one. An awesome thriller that really twists around on you a few times. Really good acting and hardly any details to gripe about. A solid movie that steps into the mind of a multi personality killer and the rollercoaster of a ride that his identities go through to find the evil one of them. This episode is brought to you by Jeff’s Spirits on Main, a local full service beverage center, located close to the D&D Farm, in West Bend, Wisconsin. 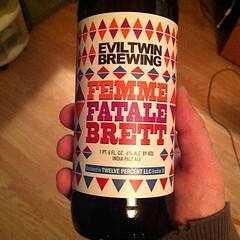 For this review we’re drinking Left Hand Stranger and Evil Twin Femme Fatale Brett.